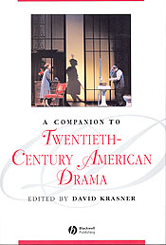 This Companion provides an original and authoritative survey of twentieth-century American drama studies, written by some of the best scholars and critics in the field. Balances consideration of canonical material with discussion of works by previously marginalized playwrights Includes studies of leading dramatists, such as Tennessee Williams, Arthur Miller, Eugene O'Neill and Gertrude Stein. Allows readers to make new links between particular plays and playwrights Examines the movements that framed the century, such as the Harlem Renaissance, lesbian and gay drama, and the solo performances of the 1980s and 1990s. Situates American drama within larger discussions about American ideas and culture.